Two separate but related sections in each song – one for keys and one for strings. Maximum creativity ensured! 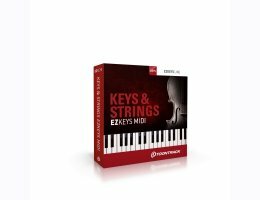 Keys & Strings EZkeys MIDI was created with the Mellotoon, its rich palette of sounds and music history in mind. However, it works just as well with any instrument in the EZkeys Line. What sets it apart from some of the other packs in the line is that it comes with two separate but related sections in each song, one for keys and one for strings. The keys section is much like any traditional EZkeys MIDI, meaning classic chord progressions and playing styles in increasing intensity. The strings section, on the other hand, has a more open tonal landscape, longer notes and is meant to complement the keys MIDI. The inspiration for the material starts around the time the Mellotron was introduced and continues all the way up until the music of today. That means this pack includes building blocks for anything from the classic rock and pop of the late ’60s to the music that tops the charts of today. Pentium 4 or Athlon processor with 512 MB RAM.